AMD has officially unveiled its first Ryzen mobile processors (or APUs as the company calls these CPU plus GPU chips), complete with some impressive benchmarks showing them outpacing Intel’s latest 8th-gen offerings for laptops. The wraps were taken off the Ryzen 7 2700U and Ryzen 5 2500U, both of which are quad-core processors with eight-threads and integrated Radeon Vega Graphics. The 2700U has a base clock speed of 2.2GHz with boost to 3.8GHz, and 10 CUs (compute units). The 2500U drops things back a bit to a base clock of 2GHz with boost to 3.6GHz, along with 8 CUs. Both have a default TDP of 15W. Naturally, the focus is on powerful performance, but also on power-efficiency, which is always a major concern when it comes to notebooks and battery life. On the speed front, AMD provided a range of benchmarks to demonstrate the power of the new Ryzen chips. In Cinebench R15 nT (CPU multi-thread performance), the Ryzen 7 2700U hits a score of 719 compared to Intel’s Core i7-8550U (latest-gen) mobile processor (in an Acer Spin 5 notebook) which scores 498. The AMD chip also wins with the PCMark 10 Extended benchmark hitting 163% over and above the performance of the AMD FX-9800P (which is picked as a baseline measure), compared to 133% for Intel’s CPU. The 8550U, however, wins at PassMark 9 to the tune of 188% plays 176%. AMD further boasts that apps launch much faster with these new processors compared to the FX-9800P, with image editor GIMP, for example, starting around 40% faster with both the Ryzen 7 and Ryzen 5 chips. So, what about gaming benchmarks – how much impact does the integrated Radeon Vega Graphics subsystem make? AMD performed the following benchmarks with an HP Envy x360 laptop with a Ryzen 7 2700U processor and 8GB of system RAM (using integrated graphics). In 3DMark’s Time Spy benchmark, the 2700U-powered machine racked up an impressive score of 915 compared to 350 for Intel’s Core i7-8550U in an Acer Swift 3, an impressive looking victory for the AMD chip. As for in-game frame rates, running Full HD resolution (1,920 x 1,080) with medium details in popular MOBA League of Legends (DX9) witnessed an average frame rate of 59 fps, effectively hitting the accepted 60 fps mark for smooth gaming. At the same settings, Counter-Strike: Global Offensive managed 49 fps (with no anti-aliasing). And at Full HD with fastest+ settings, DOTA 2 also achieved 49 fps. Overwatch hit 66 fps, although that was done at a lower resolution of 1,280 x 720 with low details. And finally, what about power-efficiency and battery longevity? A system using the Ryzen 7 2700U chip with a 50Wh battery lasts for a claimed battery life ‘target’ of 13.5 hours in MobileMark 14, and for just over 12 hours of 1080p H.264 video playback. Assuming we find similar results across all our suite of benchmarks when we actually get to review some of these Ryzen-powered notebooks, that’s a big step forward in terms of performance and power consumption, which will surely have Intel worried. And those who enjoy a spot of casual gaming while on the move will certainly be rubbing their hands together in anticipation. Better power-efficiency could also mean thinner and lighter laptops, if instead of looking at battery longevity, vendors focus on making the battery smaller (while still maintaining current levels of battery life). 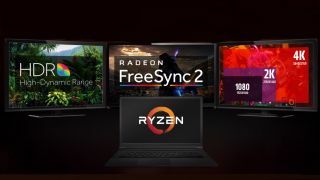 Both these Ryzen 7 and 5 APUs will be launched before the year is out, and will be found in laptops initially including the Lenovo IdeaPad 720S, Acer Swift 3, and HP Envy x360 (the latter will only run with the lesser-spec Ryzen 5). Ryzen 3 (entry-level) mobile wizardry won’t be far behind, along with Ryzen Pro (for business notebooks), with both of these expected to emerge in the first half of 2018.